Growing up, she’d heard it all. Fatty, Fatty Two by Four, Big Bertha, and worst of all, Goodyear. That nickname hurt the worst. Kids could be cruel, and her school mates were more than that – they were inventive. One year she found a canvas tent and stakes in her locker along with the label “Prom Dress”. That kind of thing takes evil genius. 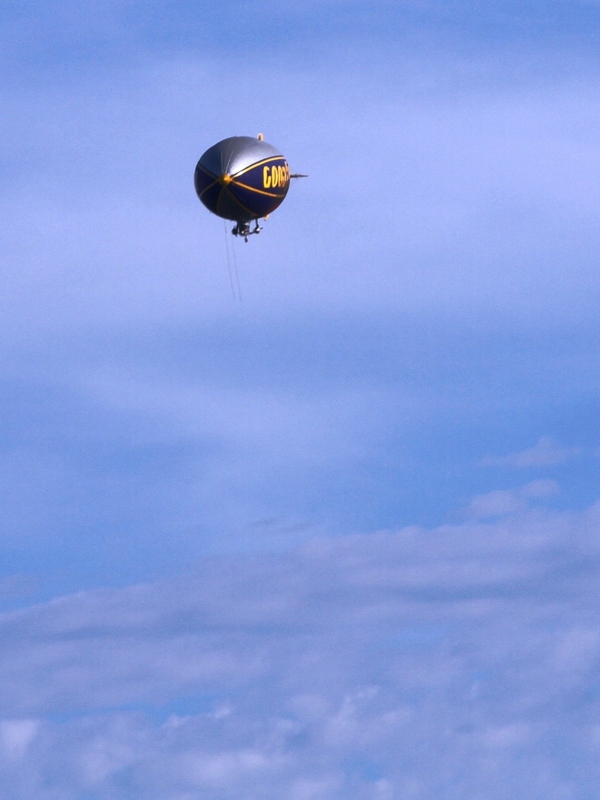 Seeing the blimp overhead brought back a rush of memories. Shaking her head, she pushed them out of her mind. When the photographer called to her, she lithely stepped back into frame for the final layout of this year’s Swimsuit shoot. The photo prompt is courtesy of Madison Woods. Her story can be found here, along with links to all the other Flash Friday Fictioneers. I have a feeling she will be sure her publicist sends them an autographed copy…..
Me, too. In fact, I remember saying “I feel like a blimp” when I was full and that was where this started from – that memory. Looks like she got the last laugh in the end. Kids can be very cruel. I’m glad my daughter isn’t old enough to be exposed to that yet. I’m not looking forward to it. My guess is you will raise your daughter with inner confidence (see below) and she will do just fine! Thanks for reading. Inner confidence overcomes everything! Thanks for your comment. What a great payback tale – and perfect use of the Blimp prompt. Excellent refresher of our miserable high school years and the cruelty and evil our contemporaries got up to. NIcely written also. So Bravo, Erin! Thanks – it was an unintentional direction. Once I started writing it chose its own path. Terrific! And that observation that being inventive was worse than being simply cruel – brilliant. And such a true story; the opposite is sadly true as well, as in Bruce Springsteen’s Glory Days. I wish all the cruel kids could have this implanted in their minds. Yes – those who can’t wait to leave their High School days and those who relive them over and over. I was somewhere in between – it was a fine time, but I don’t go back. I’m bowled over by the cruel inventiveness of those bullies you put into your piece! Very interesting take on the prompt, and very effective. Bravo! Thank you! I hope no one ever really got a tent with that message. Yikes! Thanks, Craig. I’m glad you enjoyed it. Beautifully told, I’m glad she mostly got over the pain and triumphed in the end. You created the children’s cruelty with a vivid brush whcih I hope isn’t one of experience. No, not from experience – but from observation. I think we all witness this kind of stuff and as kids aren’t always capable of standing up for someone else. It’s a great story, but it’s also a spot on picture of the nature of cruelty. Good for her! Woah! former “Michelin Man” turned swimsuit model.. good one. Nice take on the prompt. You must have read my prologue. My daughter was heavy-set and had to deal with that crap. It’s tough. I loved your ending, sort of an ugly duckling story. How many nerds grew up to be CEO and had to listen to the whining high school football star beg for a job. Justice is sweet! Although those kids were cruel, I couldn’t help but laugh at the nicknames and pranks. It’s not easy when you’re picked on in school. Nevertheless, the story is funny. I have a cousin who was tall before the rest of us (we were about 12) and that year for Christmas, my mom made her a nightgown. One of her brothers said if tent stakes had been included, they could use it for camping. It was meant to be funny, but at that age it was something that really stung. I used part of that in the prom dress line. Very creative of you. That speaks to versatility in writing. they were cruel, and I grew up with them. I know just how she felt, my issue was not weight but at the time it really mattered. Thank God, I too became the person hiding within. I give this a 5 stars out of 5! Thank you! I think we all have memories of either teasing or being teased and know how it feels. always love a good twist at the end. Thanks, Rich. Always happy to have your input. Great story with the perfect revenge–still, those cruel taunts leave lasting scars. Good job! Revenge in a tropical setting. Not bad work if you can find it! Nice one, reminding us just how cruel kids can be. But she turns the tables… feel good ending. I loved this! I hope all those kids who taunted her ended up on fat farms. Good job! Thanks, Rochelle! That would be perfect pay back. Nice twist Erin. Kids can be so cruel and those memories can haunt you. It’s fun to see what comes out once you start heading in a direction. This one surprised me! And once the photoshoot wrapped up, she started preparing for her upcoming appearance on The Maury Povich Show! Sorry, couldn’t resist. My Mum used to love that show. She has terrible taste. They say the best revenge is living well. I say, the best revenge is living well and flaunting it in your old adversaries faces. Or, failing that, a good old fashioned spree killing.